Clayton and Shirley Fordice pleased to own Al's bike. Approximately 80 bikes carrying friends, neighbours and relatives left the Wetaskiwin West Fire Hall, 5940-40 Ave (Hwy 13) at 11:00 am on September 15th to begin a commemorative bike ride in memory of Al Lund. “Al Lund, passed away unexpectedly on October 24, 2012 . Al was an avid biker, owning motorbikes from an early age and passing his love of riding on to his wife and children. Al and Kathy took part in many road trips on their one-of-a-kind custom painted bike going as far east as Winnipeg and as far west as the Coast. Their longest trip was to Branson, Missouri. 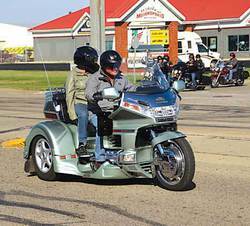 Al and Kathy were well known for their participation in ‘bike rides’ including both of Wetaskiwin’s Toy Rides. Although Al is sadly missed by his friends and family, they decided what-better-way to remember Al than to host an annual memorial bike ride in his honour. The 1st Annual was held on September 15th, 2013 with the proceeds going to the Wetaskiwin and District Heritage Museum. The Lund family have a long history with the Museum. Kathy is the current Chair of the Board of Directors of the Wetaskiwin and District Heritage Museum. Al was always available to help, when needed. Kathy’s parents were involved since the time the museum was located in the old building and her mother, Virginia Sherburne was the Secretary . Al is survived by his loving family; wife of 44 years, Kathy; children, Wyatt (Brandy) and granddaughter, Kylie, Ryan (Tara) and granddaughter, Aven; siblings, Rita Palmer, Pat (Jack) Knapp, Leona (Garry) May, Larry (Esther), Grant (Janet); sister-in-law, Betty Lund as well as numerous nieces and nephews. All riders were treated to a hot dog lunch at TrikeZone at the end of the run. The Heritage Museum, located in the heart of Wetaskiwin's historic downtown, has been preserving local history since 1986. The current location officially opened its doors on May 7th, 2005. The museum currently offers three floors of exhibits relating to everything from First Nations' history to the War Years. Learn about Wetaskiwin's early businesses, read about the extraordinary Women of Aspenland, see an authentic tipi, and have a glimpse of life on a Hutterite colony. The entire building is home to a collection of more than 15,000 artifacts.